Before and after in Adamstown - The Newcastle Bath Co. 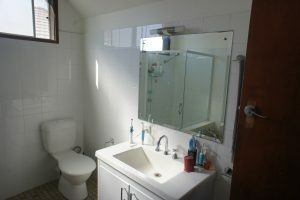 This bathroom in Adamstown heights received an amazing makeover! 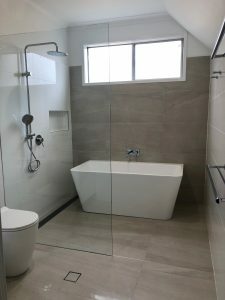 Although the existing bathroom was functional, it was dated and there was a leak from the shower onto the downstairs ceiling. A renovation had to be done ASAP. The owners brief was simple, they wanted to replace everything in the same place. After an in home consultation with our amazing designer, Sophie Marsh, that soon changed. The bathroom was reconfigured to include a few fantastic key design elements that turned this bathroom into a beautiful space. 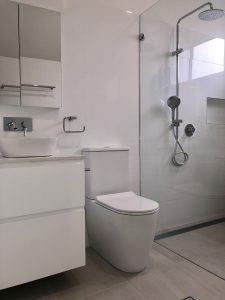 The couple wanted a ’modern classic’ bathroom as they are planning on putting their house on the market in the new year. 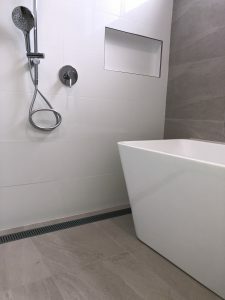 At the tile shop, Sophie suggested using a neutral large format tile (900 mm x 450 mm) for the floor and also running the same tile up the wall behind the bath as a feature. For contrast a 600 mm x 300 mm white tile was used on the other walls . Sophie also helped in paint colour selection to compliment the tile choices. For minimal extra cost the bathroom was rearranged and a few design ideas were added. Changing things around allowed a better look and flow to the room. Opposite the entrance a stunning back to the wall bath was placed . This gave the room a real ‘wow factor’. 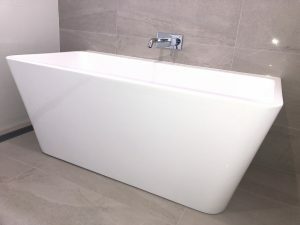 Back to the wall baths look like freestanding baths but are square across the back and fit against the wall so there is no messy void at the back that you have to clean. Placing the shower next to the bath without a screen between created a ‘wet room’ . A strip drain was placed along the wall behind the shower and the bath to make sure there was adequate drainage. A simple frame less shower screen was placed on the other side next to the toilet. In the corner a lovely above counter basin was used that complimented the bath. Functional elements of design were also incorporated such as recessed shaving cabinet placed above the vanity for extra storage. A little niche was also added above the bath for shampoos etc. The dual shower is a fantastic idea that allows for great versatility for a family. The 1.5 m hose on the hand held shower allows reach to the bath which is super handy for kids and cleaning! The owners were thrilled with the end result. 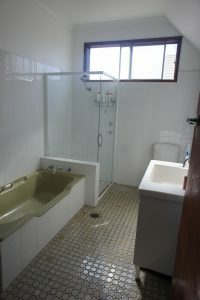 This is a bathroom that will not date and is sure to make a difference to their bottom line come sale day. Call us at The Newcastle Bath co and book your obligation free quote and this could be your next bathroom!